The author of Between Debt and the Devil offers a radical prescription for fixing global finance, but it risks overheating the economy and causing inflation - as well as shocking a few central bankers. 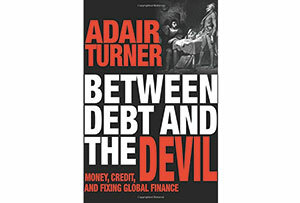 Adair Turner offers a convincing account of the debt-fuelled global economic cycle of the last 15 years or so. I found myself skimming over large sections and nodding in agreement - much of the story detailed in the first two-thirds has been rehearsed elsewhere, but Turner brings it together clearly and concisely. And he rightly draws attention to the problem of excessive debt - household mortgage debt in particular - as the dominant theme for our times. I have some quibbles: the current administration appears to believe that public debt is bad and private debt is good, and Turner demonstrates the stupidity of this view. But he takes the opposite position: private debt bad, public debt good. This view is equally fallacious: debt is debt. He said governments should finance fiscal deficits by printing money. And he said that the stock of government bonds already held by central banks should be written off (more precisely: restructured to become 'perpetual' bonds, which never mature, and which therefore never get repaid). These two steps would mean that, at a stroke, we could stop worrying about government debt and keep the economy afloat with government spending, while households gradually paid off their mortgages. Et voila! Can it really be that simple? No. As Turner acknowledges, you can't just burn debt obligations without hurting somebody. But who gets hurt in this case? You would only be writing off that portion of debt that was held by another branch of government. Net effect on the government as a whole: zero. A bit like transferring money from your savings account to your current account. The most obvious objection is that if you save someone (the profligate government) once, you are implicitly promising to save them every time: expect their behaviour to change as a result. Turner is sanguine about this risk; I am not. If the central bank allowed its holdings of government debt to be restructured in the way Turner proposes, then it would be holding a worthless asset. But it would have a corresponding liability (cash in circulation and reserves posted at the central bank by private banks) that is worth something - at least to start with. That inequality would matter if the global economy ever got back to 'normal'. It's a bit like turning the heat up to maximum under a pan to bring it up to the right temperature - makes sense as long as you can turn it down again later. Restructuring the asset in the central bank means you can't turn it down: you're committed to having that much high-powered money in circulation for good. Once back to normal, we would either have to reverse the debt restructuring and sell the debt back to the market, or accept much higher inflation (like burning the contents of the pan). Turner waves away this objection by saying that central banks could tighten policy rates to prevent excessive inflation (like adding ice to the pan). But that would imply a far more aggressive path for policy rates than in the past (you would have to keep on adding ice, because normally the gas is not stuck on full). So be it, Turner might say: we need the economy to run hotter, even if we have to break some taboos and risk overheating to get it there. If the problem is deficient demand, as he asserts throughout the book, then he has a case. But what if the problem is on the supply side? What if the debt-fuelled, housing-market-led cycle of the last 15 years has undermined the long-run supply potential of the global economy? What if 'excessive debt' is really another way of saying 'misallocation of resources'? Then boosting demand, without reallocating those resources, will just lead to inflation, in asset prices or consumer prices or both. We've seen that film before - in the 70s (consumer prices) and in the noughties (asset prices). Here we go again.